Instead of the chicken, I used an extra sweet potato and a can of drained black beans (not paleo, but I don’t do that so whatevs). Sautéed the beef and veg in the Instantpot and used 3 tsp of all the spices (except the crushed red pepper.) Also didn’t have a full 4 oz of goat cheese, so used a few triangles of Laughing Cow Cheese. The sweet potatoes disintegrated, but they thickened the soup nicely. This was really good! I’ve made this recipe twice now, once in the slow cooker and once in the pressure cooker. It is so tasty! At first I was hesitant about just throwing in the raw meat without browning it but was so easy! The only thing I would change is to break the raw meat up some before cooking. The ground chicken ends up as little strings that look like worms, and when I broke up the ground beef after cooking it also kind of smashed up my sweet potatoes so they were mashed into the soup instead of chunks. This is a keeper! I just made this recipe for dinner and my husband called it “miraculous.” I made it in the Instant Pot and browned the meat first, then drained the fat before adding in everything else. I cooked it on the meat/stew setting for 20 minutes, let it natural release for 10 minutes and then quick release. There was still a lot of pressure left at that point, so I think letting it natural release entirely would have taken FOREVER. It was a little bit soupy so maybe next time I’ll only use 3/4 cups broth, but it was a great recipe and I will definitely make it again. Thanks, Gina! I made this but omitted the red chili flakes. It’s very mild. I regret adding the goat cheese (unless I read the recipe wrong), as it muddied the flavors and made it even more mild. As a garnish it would have been better. I may add some shiracha sauce to spice it up a bit. I’m not into spicy foods but it needs a little bit more heat. Used Instant Pot, browned meat and veggies and used 3/4 c broth to reduce total liquid when done. Reduced pressure cooking time to 20 minutes since partially cooked due to browning. Wonderful comfort food. Thanks for really good recipes. I sauteed the meat with a little salt first, then added everything else. Pressure cooked for 15 mins and then allow 10 mins before quick release. Came out perfect. Got an instant pot for Christmas, and I’m TOTALLY in love ~ this is the first recipe I’ve tried that wasn’t out of an “instant pot” recipe book. Oh…my…goodness…!!! Fabulous!!!! Thanks Gina!! 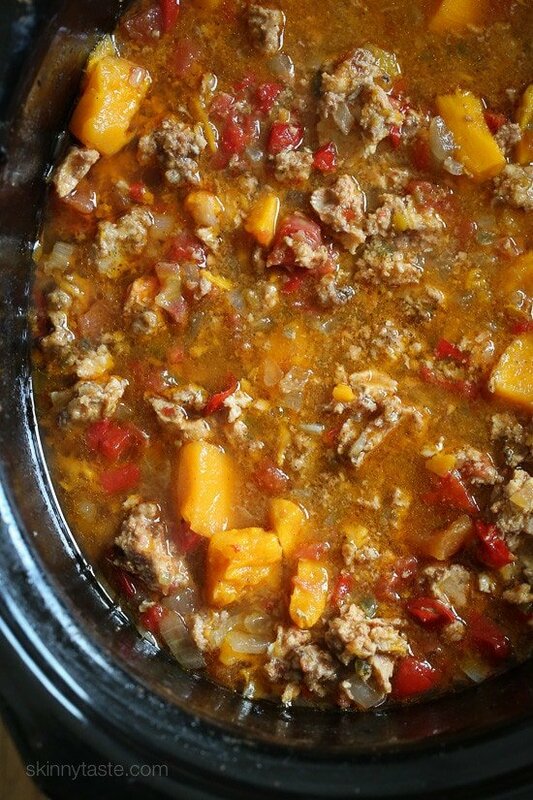 I made this tonight for dinner in my slow cooker, I followed the recipe exactly. It was so good with the avocado. My husband even liked it even though he does not normally eat anything that was in it execept the meat and the jalapeno. I made it in a 6 quart slow cooker. This was an unfortunate fail. I made it in the instant pot under pressure for 20 minutes. It was incredibly soupy, the meat was nearly impossible to break up, and the sweet potatoes disintegrated. Ended up chucking it and went out for dinner. Bummer. 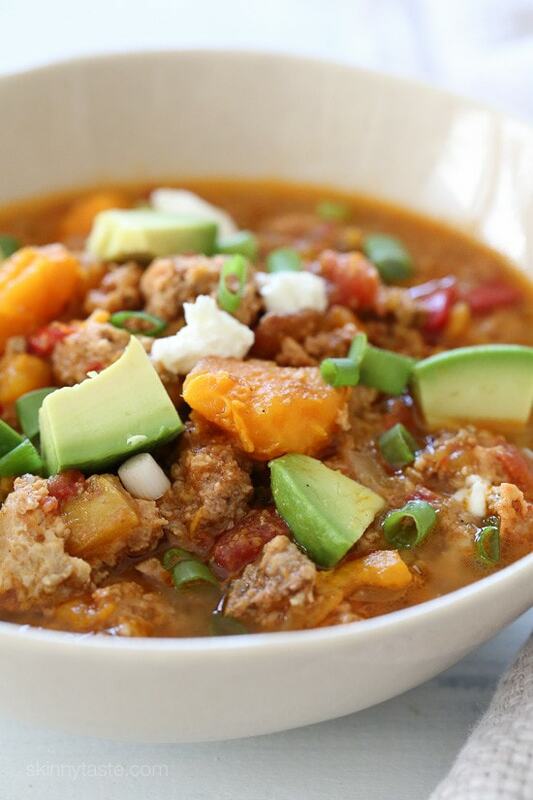 Love this recipe – have made it several times always using a crockpot! I noticed that the sweet potatoes kind of disolved each time so the last time I made it (this past weekend now that it’s fall weather) I added the sweet potatoes for the last 2 hours and it was perfect! They were soft but held their shape. Just curious if this would taste good if I substituted the sweet potatoes with butternut squash? And would the cook time in the Insta pot be the same. Thanks. Hi Stacey! 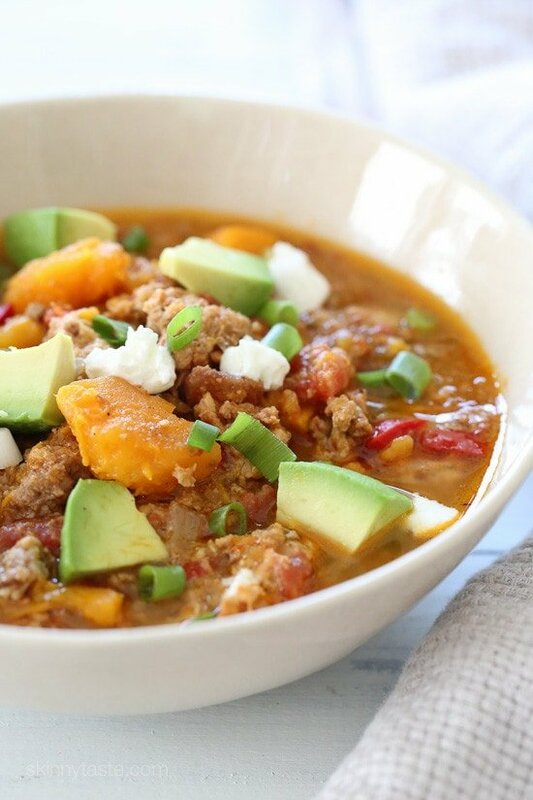 I just made this with butternut squash and it is so delicious! I did not have sweet potatoes, but I think I am going to keep making it with the squash because it is so good! I don’t have an Instant pot, so sorry I can’t answer that part. I made it on the stovetop. I love this recipe! I made this tonight but cooked it on the stove top since I had limited time. It was FANTASTIC! ? This turned out fantastic! I browned the meat before adding it to the crockpot. I used one lb of ground chicken and a can of black beans. It needed more chicken stock but I think most recipes you should adjust the liquid depending on the amount of ingredients and your personal preference. 8 hours on low and it was perfect. Full of flavor with some kick. Thanks for the recipe inspiration! I have this in the slow cooker as I type. It smells and looks delicious but it is very soupy. Has anyone tried this over noodles or rice? Delicious! I made it in the slow cooker. I used ground turkey and a can of mixed beans. Omitted the broth as the canned tomatoes brought plenty of liquid. So good! I cooked this for 8 hrs on low and the hamburger is still pink. The slow cooker automatically turns to warm so I feel like this is ruined now. Why wouldn’t the meat be browned before making the soup? I wonder if the discrepency is instant pot versus slow cooker users? I did this in the instant pot and it was delicious but very watery. Usually there’s some adjustment for instant pot recipes bc you don’t lose any liquid (in fact you gain some from the veggies and meat breaking down). I may try draining the canned tomatoes next time to see if it helps. 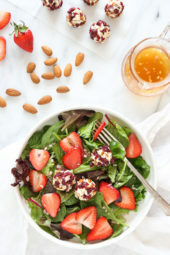 I have probably made at least 50% of all of the recipes on this website and this one is BY FAR my favorite. It is like a family recipe to us now! My aunts, cousins, parents, boyfriends parents all make it. I’ve been waiting for fall to come around again to make it and I can’t wait! This is also amazing when you’re on Whole 30 because it has so much flavor. MAKE THIS YOU WON’T REGRET IT! 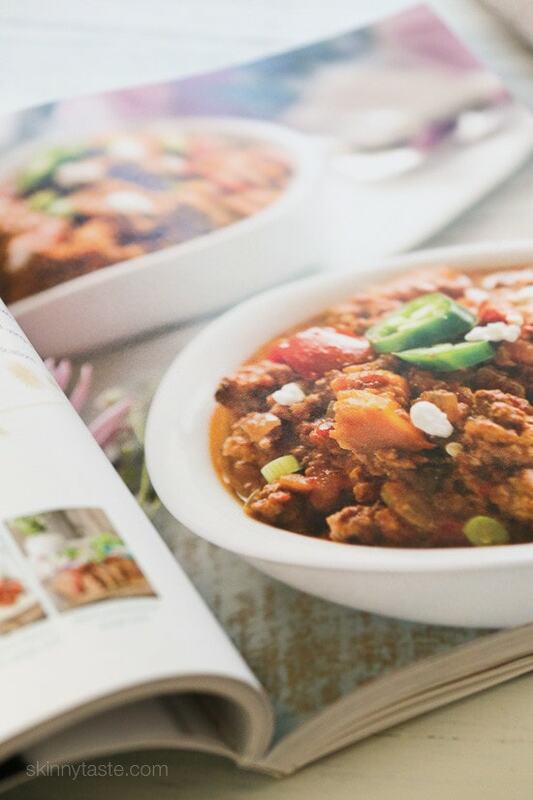 Do you stir the ingredients together before turning on the slow cooker? Or just sort of layer them in and then stir at the end. I imagine as everything cooks down it will get combined, but just wondering what works best. Thanks. This recipe was amazing!!! My entire family loves it and unfortunately, there were no leftovers! I added a can of white beans because my family loves chili with beans and it was delicious. Thank you for sharing your recipe!!! My food came out extremely watery and my sweet potatoes disappeared! I think maybe 25 minutes was too long! I was also confused why we don’t sauté the meat. Anyways, I’ll have to pass on this. Similar experience for me for the instant pot setting! The flavours are there but if I were to redo I think 20 mins would be good, and brown and break up the meat beforehand. 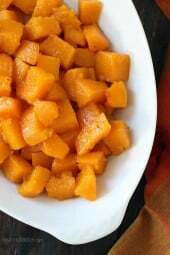 Love this recipe have made it many times. I love love love the goat cheese with the sweet potato and ! Such a great flavor combo. I garnish with cilantro and goat cheese. I also add in a can of white beans, it makes for such a filling and delicious meal! I’ve made this 5 times now. My new go to recipe! Love this recipe. Have made it twice now! Made this as my friend altered it with 2/lbs of ground turkey instead. Yummy!! This was absolutely delicious! I made this chili last night and added shredded chicken over the ground chicken. Followed the recipe fully other than that one substitution and was thrilled with how it turned out. I did add the goat cheese to the top and it was the icing on the cake. So glad I have plenty for left overs! Happy to enjoy this meal a few more times. This was amazing!!!! My husband kept talking about and how it’s his new favorite!!! We LOVE this chili – it’s a nice break of something a bit different vs. the usual types of chili I make. I usually make it in the crockpot, although most of the time it ends up on high for 3-4 hours. Last night I made it in the instant pot. I did saute everything first and then put it on soup mode for 30 min. Also delicious, but think I like it better in the crockpot. BTW – in the instant pot, I mostly did natural release…..got impatient and let some steam off though. I was so excited to make this after reading the reviews, but unfortunately my chili turned out VERY soggy/liquidy. I followed the recipe exactly (with the exception of substituting ground beef with another pound of ground chicken). The taste is there, but the weird consistency makes it almost inedible. Did this happen to anyone else? This is the first Skinnytaste recipe I haven’t enjoyed. Admittedly, I used ground turkey instead of ground chicken. I think using poultry and not browning the meat first gave the recipe a sweet and gamey taste I did not enjoy. My husband didn’t mind the taste. Nothing overtly wrong with the recipe, just not my preference! Is this the same amount of smart points for the new freestyle program? What can you do if you don’t have an instapot or pressure cooker? You can simmer it on the stove! Can I make with ground turkey instead of chicken? do you cook the meat first? or ground beef & chicken go in crock-pot uncooked? Does this fill the instant to the rim or could it be doubled in the pot? Would one recipe feed 7 adults? Quick release or natural for instant pot? Does the 7 SP count include the goat cheese or do I need to calculate that separately? Thanks for confirming! I thought that, but wanted to be sure. I made this last night on high in the crockpot. I used water instead of broth. It was really good and sooo easy. Love that it has the sweet potato in it for extra vitamins. I cut them up small because my husband doesn’t eat sweet potatoes and he didn’t even notice. I added kidney beans to it also.Yum. I just started Whole 30 and this is delish. No goat cheese for me, but a fried egg on top is to die for. Thanks for your great recipes. Yum! This is chili has great flavor! I was thinking about adding beans next time, but I did like how it was a lighter feeling chili without the beans! What would the directions be for the instant pot? I would use the chili button for timing. Does anyone knows the ww smart points for this if we just use ground chicken? 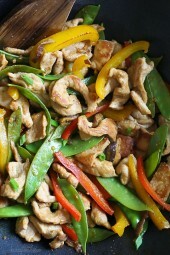 Could you make this with 2 lbs ground chicken instead? 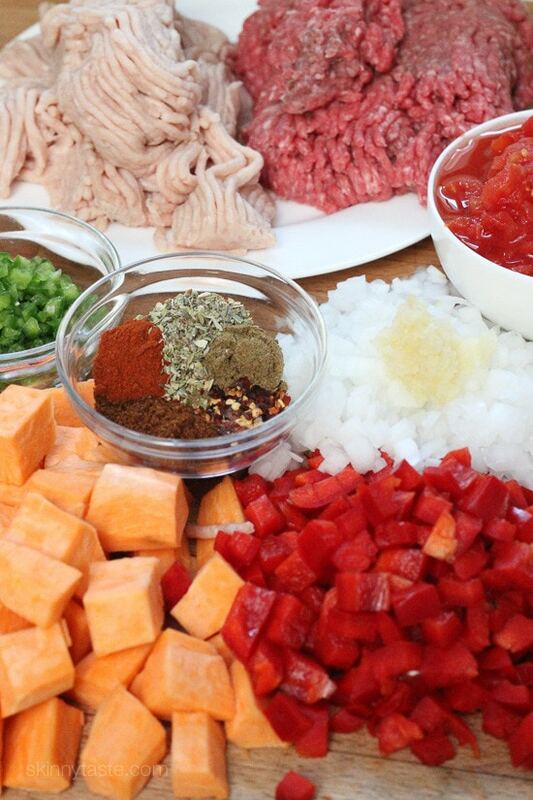 Do you know the smart points value if you use all ground chicken instead? Could shredded chicken be used in place of ground chicken? I brown the meat first using the saute button. Then once it’s broken up (even if a little pink), I add all the other ingredients and select Meat/Stew for 30min. It’s my favorite chili recipe! Is it also 7 points if the goat cheese is left out? Would it be OK to cook this on a 6 hour slow cooker setting?